Shelby County Highway Department employees Zach Hill, left, of Sidney, and Myron Gaier, of Fort Loramie, install a new stop sign at the intersection of Mason Road and County Road 25A. 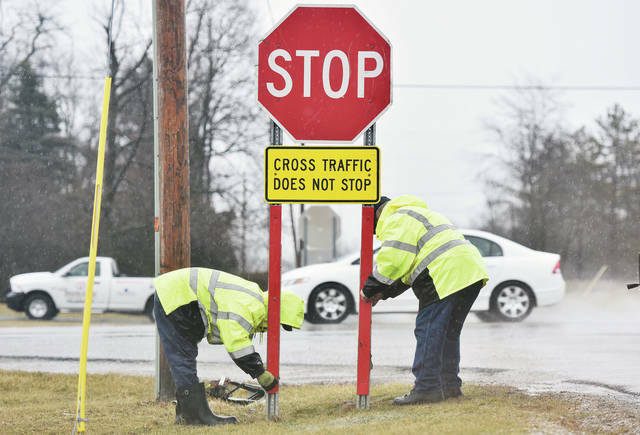 The two men stood in the pouring rain Thursday, Feb. 7, to replace a stop sign that had been knocked over by a semi trailer. The rain made for lots of flooded farm fields and a high fast waters in area creeks.